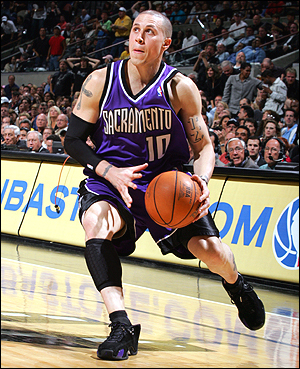 The Bibby trade talks between the Kings and Cleveland Cavaliers have resurfaced, according to Sacramento Bee. Although the discussions between Kings basketball president Geoff Petrie and Cleveland general manager Danny Ferry have temporarily stalled, a three-team deal appears to have come close to taking place. The Cavs were believed to be after the rights to Argentine center Luis Scola as well, which the Spurs own. When the talks broke down, the Spurs dealt Scola and reserve forward Jackie Butler to the Houston Rockets. There are expectations the Kings and Cavs will continue to have discussions directly and with other teams. The Kings, looking to add more scoring to their front line, have been interested in Drew Gooden. According to the Akron Beacon Journal, Damon Jones also might have been included in the potential deal.